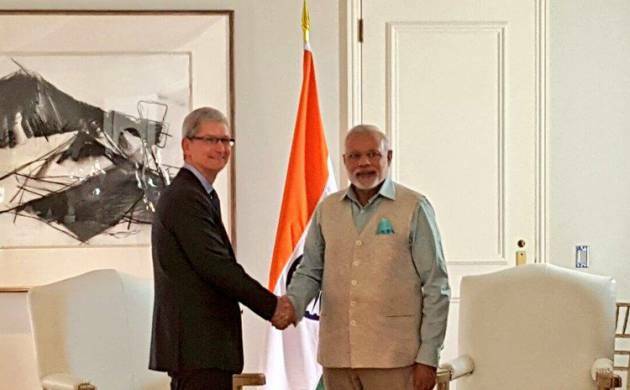 Apple CEO Tim Cook will visit India later this week and is likely to meet Prime Minister Narendra Modi, as the iPhone maker seeks to cash in on the “huge potential” in the world’s second largest smartphone market. Tim Cook is expected to discuss matters pertaining to manufacturing in India and the potential of the Indian technology market, according to sources. However, Apple declined to comment on his schedule when contacted. The Apple CEO’s visit comes at a crucial time when the US-based firm is focusing on new growth markets like India after posting its first-ever decline in iPhone sales. In an interview earlier this month, Cook had said Apple sees a “huge market potential” for its products in India and that it is “really putting energy” in the country. Apple has also sent in a proposal to the Indian government for selling refurbished phones in India. However, no official call has been made on the matter. Addressing analysts in a conference call, Cook had said that India presents a “really great opportunity” but slow networks and the informal retail structure across the country is holding the company back from realising its full potential. While its sales in China, its second-largest market after the US, fell 11 per cent, in India iPhone sales were up 56 per cent from a year ago. “But I view India as where China was maybe seven to ten years ago. From that point of view, and I think there’s a really great opportunity there,” he had said. This is despite the global sales remaining flat globally in the same time period. Samsung led the India smartphone tally with 29 per cent share. Other top players included Micromax (17 per cent share), Intex (10 per cent), Lenovo (8 per cent), Reliance Jio’s Lyf (7 per cent) and Karbonn (5 per cent). According to the report, Apple in India recorded a stellar 62 per cent growth in the first quarter from the year-ago period, though on a lower base. India is a big market for Apple’s other products as well, including the iPad and iPod.